This morning we welcomed Lucy. She is a 3 month-old, 12 pound, Goldendoodle cutie. As soon as she came in the front door of Fort Fido she was sniffing about and having a grand time looking around. She then entered the medium roll with high morale. Lucy got to mingle throughout the entire medium roll making a lot of new friends. 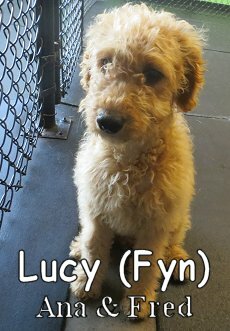 Lucy has had a marvelous time and got to associate The Fort with fun and socialization. We are looking forward to having her return for more fun. We had a magnificent time welcoming the charming Maggie May to Fort Fido yesterday. 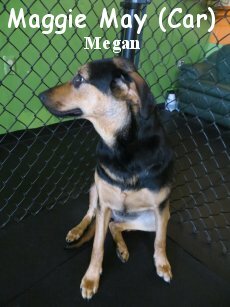 She is a 65-pound, 1 year-old, German Shepard mix. Maggie May was curious as she entered Fort Fido yesterday and took her time sniffing around. After taking that time to pick up what The Fort was about, she began to play with Daisey (See the video below!) and had a fabulous time romping about in the large roll. Maggie just relished her time here and we look forward to seeing her return for more fun.